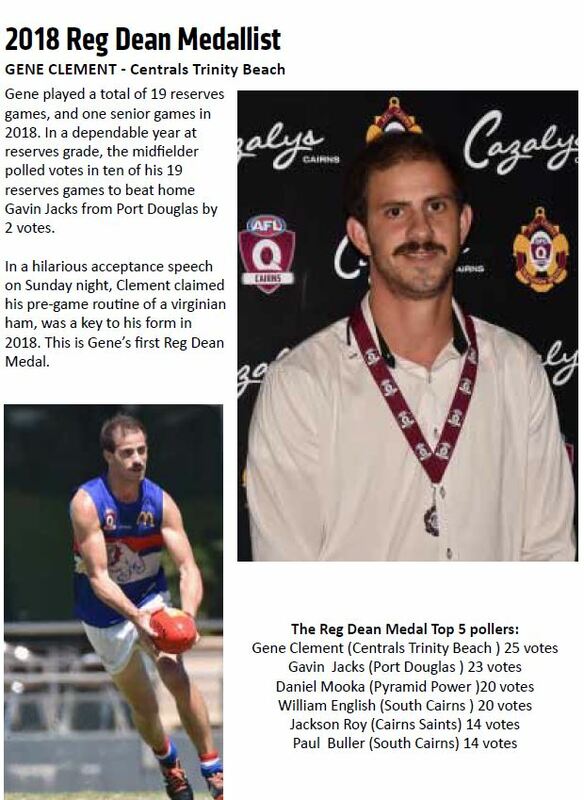 Reg Dean was Vice President of the League at the time of the inaugural Best and Fairest Award for the Reserves. In 1975 when he was President of the CAFL (now AFL Cairns Ltd.) he was made a Life Member of the League. His involvement stemmed from the fact that his two sons both joined North Cairns and became involved with the League. He held several positions on the League over a twenty year period including President, Treasurer and Tribunal Member. He always followed the Reserves competition closely and was very honoured to be able to be the Donor of the Reg Dean Medal so much so that he asked his family to continue the tradition after his death and they feel very honoured to do so.